In a large saucepan, cover the chicken breasts with water and bring to a gentle simmer. Cook over moderately low heat until the chicken is white throughout, about 12 minutes. Transfer the poached chicken breasts to a plate and let stand until cooled slightly, about 10 minutes. Meanwhile, in a small bowl, whisk the mayonnaise with the rice vinegar, wasabi powder, Asian sesame oil and 1 1/2 tablespoons of water and season with salt and pepper. 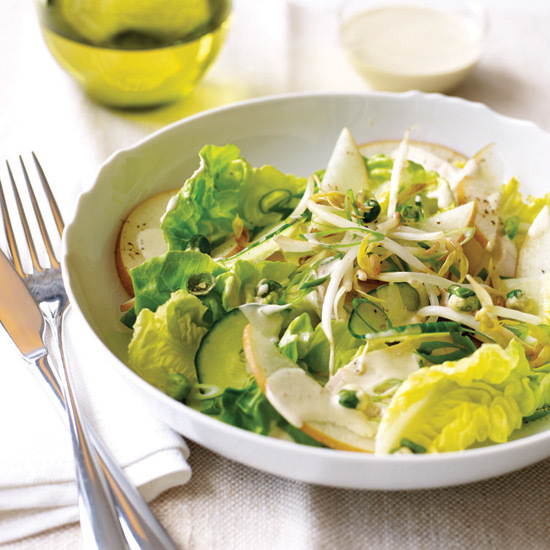 In a large serving bowl, toss the lettuce with the Asian pear slices, cucumber, scallions, bean sprouts and 2/3 cup of the wasabi dressing. Slice the chicken breasts crosswise 1/4 inch thick and lay the slices on top of the salad. Spoon the remaining wasabi dressing over the chicken breasts, sprinkle with the chopped wasabi peas and serve at once.